Two dive professionals and bike enthusiasts - Allan Nash and Tommy Soderstrom - will ride all around Australia starting from August 2011 to raise funds for charity. By Sarah Joseph. Puerto Gallera, Philippines, 8 July 2011. Allan Nash and Tommy Soderstrom, both PADI instructors and owners of Asia Divers and El Galleon Dive Resort in the Philippines, have hatched an action-packed fund-raising scheme supported by PADI, Project Aware and the Springboard Foundation. This ride circumnavigating Australia aims to raise funds to battle the destruction of marine life through Project Aware, as well as to support the street children in the Philippines through the Springboard Foundation. “For years we have been a supporter of the Springboard foundation that helps real people in need. Some of the homeless children have been abandoned from the age of two, others disabled, with no place to go, no hope, lost and lonely,” said Allan Nash. “Such kids look for every opportunity in life and given half a chance will take whatever they can get, sometimes with devastating consequences. Springboard and its supporters gives them viable choices, helps them become respectable people,” he added. The ride on BMW 1200GS will start and end at Sydney, with stopovers at these cities for meaningful interaction with dive communities: Melbourne, Adelaide, Perth, Exmouth, Caines and Brisbane. On Sunday 9th of October 2011, the duo will make a special appearance at ODEX in Brisbane by riding to the hall, giving a talk and conducting a raffles draw. Dive centers are welcome to host the biker duo during the ‘Dive Day’ stopovers with a beach cleanup, leisure dives followed by a BBQ where a bronze dollar donation will be collected from all participants with F&B purchase. There will be attractive prizes to be won from top brands such as Waterproof, Cressi, DAN, and a week’s stay with unlimited dives at El Galleon Dive Resort and Asia Divers in the Philippines. Well-wishers can donate a lump sum or a specific amount (e.g. five or ten cents) for each leg of the distance covered (see sector chart) if not the entire 14,000 km of the journey. 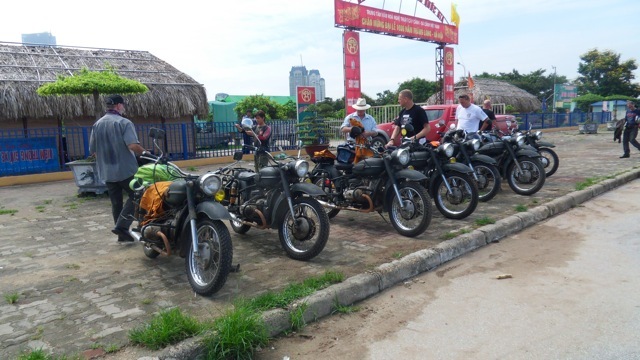 For preparation Allan Nash and Tommy Soderstrom rode their bikes from Hanoi along the Ho Chi Minh Trail down to Ho Chi Minh City. Aussie Fundraisers seek the support of dive centres, dive equipment manufacturers and scuba divers by way of donations and sponsorships. Dive centers can pledge their support in exchange for logo acknowledgement starting with $50 while manufacturers can sponsor cash towards the cause and/or in kinds for prize giveaways during the BBQ raffles draw. Confirmed sponsors are PADI, Cressi Sub, Waterproof, Asia Divers and El Galleon Dive Resort. “All money raised will be donated to Project Aware and Springboard Foundation. Both act for the betterment of people and the environment, so please help by showing your support.” The cost of the ride and logistics is estimated to be around $22,000, which will be borne entirely by Asia Divers and El Galleon. The duo will blog their experiences on Aussie Fundraiser web (http://aussiefundraiser.org), Facebook page in addition to publicity support from PADI and Project Aware.